Millions of sales professionals work to earn a living around the globe every day. But very few are actual Sales Pros. A sales professional is somebody who is paid to sell a product or service. Sales Pros are the best of the best. Not only do they earn a living in sales, but in most cases, the best of the best Sales Pros earn a handsome living! These are the upper echelon…the top 1% of consistent over-achievers who consistently outperform the competition and win all the prestigious awards year after year. So, are these Elite Sales Pros just blessed with an inherent know how? Did they just inherit the rare sales gene? I do believe that the most Elite Sales Pros do actually possess many personality and character traits that are common among the most successful sales people. However, based on my own 25-plus years in sales and sales management in consumer products, hi-tech and the medical device industry, I ve noticed that the most successful sales people with whom I ve worked, managed and been around also regularly incorporate a lot of the same techniques, practices and habits which enable them to achieve success on a consistent basis. Success that most of their colleagues and competitors rarely achieve. This book lists the top 40 that no matter what industry you work in you can incorporate and apply to make you more successful as well! I’ve learned the techniques, practices and habits in this book through many successes and, yes, many failures too. 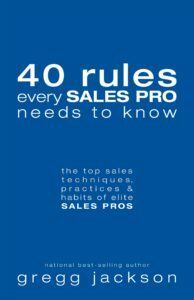 Applying these vital learned lessons has enabled me to regularly over-achieve sales plans, receive numerous promotions to leadership positions, and win numerous President s Clubs Awards trips, MVPs, and Sales Rep of the Year awards. And the application of knowledge is wisdom. And knowing what the most Elite Sales Pros do on a regular basis is vital if you desire to become an Elite Sales Pro! I hope and pray that this little book helps to better inform, encourage, and inspire you to greater heights in your sales career and in every other area of your life where you are engaged in the fine art of relationship building and persuasion! So read it and DO it! Check out Gregg Jackson's other books!